In a lawsuit which threatens to overshadow the 50th anniversary of Britain's long-running science-fiction series, Doctor Who, the son of the man who wrote the first episode, "An Unearthly Child," is suing the BBC for breach of copyright, since they have not given his father credit for having invented the iconic, time-travelling blue police box. Read more about Who Owns The TARDIS? Tonight we meet the Doctor's wife, after a fashion. 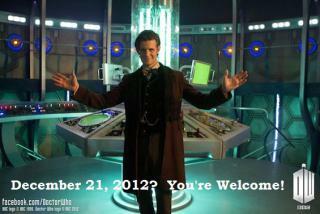 Are there still living Time Lords? And who is that knocking on the TARDIS door? Today's video takes place between "Flesh and Stone" and "Vampires of Venice"... Amy is really putting the moves on the Doctor, and we get a bigger sense of why adding Rory to the mix was absolutely crucial. That, and a cool retrospective of the Doctor's many comely companions..... Helloooooo Leela!